When I blogged about the ancient city of Ephesus, I was impressed with the number of baths. At least four bath complexes were found in the city. All that remains are skeletal structures of partial brick walls, so you do not get a feeling for the grandeur of Roman Baths. Bathing was a major pastime in the Roman World. I think the city of Rome had over 600 baths. And they were public baths that anyone could visit. Patricians and plebeians bathed side by side bringing their slaves and servants. However, I would suspect, with 600 baths, class separation must have existed. I guess a typical Roman worked till about noon, then headed for some light exercise and several baths before returning home for dinner. 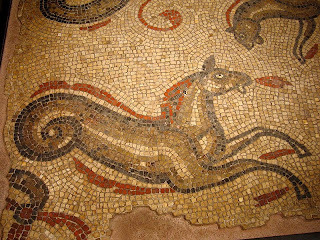 This triggered my memory of a visit to the Roman Baths and museum located in the town of Bath in Somerset, England. Much of the site has been restored to nearly original condition. 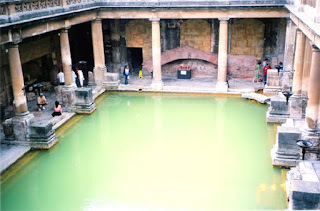 The main pool, fed from natural hot springs, was a revered site by the Pre-Roman Celtic population, who deemed the steaming waters to be a sacred place of their goddess, Sulis. The Romans, who knew a good thing when they saw one, quickly identified Sulis with the Roman Goddess Minerva and constructed a temple and bath around 60AD. They continued to improve the bath complex the next 300 years of their occupation in Britain. There are several baths still filled with water, which include the main bath that fed by the natural 114 degree (F) spring water and is about the size of an Olympic swimming pool. The Romans also constructed a calderarium, which is heated artificially and a fridgidarium which is cold to refresh and close your pores after the hot baths and exercise. The pool and structure is lavishly designed and decorated. It makes most the public pools that I have swam in look shabby in comparison. Perhaps something in Las Vegas would compare to it. The marble pillars, the lavish mosaics and refined statuary are something that our culture has lost the desire to produce and the will to finance. The most mind boggling thing about this bath is that it was at the far edge of the empire. 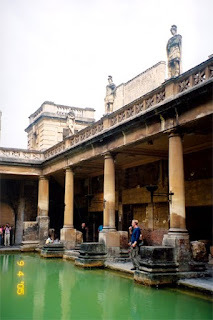 Aquae Sulis was about as far from Rome as you could get. If this is what they could do on the fringes of the empire, imagine what the baths in Ephesus or Rome were like? I've seen this twice, once about 20 years ago when they were not as far as long with the renovations and again four years ago. Your photos brought back some wonderful memories. It is a fabulous place to visit, and you are right, it puts our public pools to shame.